She is 6 years old and has never been to school. She has never had a reading or writing lesson in her life, yet she is a fluent reader and a competent writer. No-one has ever sat down and taught her. Instead, driven by her own motivation to communicate through text, she has taught herself: discovering her own strategies, finding joy in experimenting with language, and feeling a profound sense of pride in becoming more independent. Some people believe that children can’t learn to read or write without being taught. Jess is proof that they can. From a very young age (probably before she could even talk) one or other of us parents has sat (or lain) with Jess in the evenings to read stories. As a baby, we’d choose the stories for her – picture books or board books – but as she grew into a toddler, she’d choose the ones she wanted to hear herself, from the bookshelf or the boxes we had scattered around the house. She would often choose the same books, night after night after night. She would listen, and learn the stories; she learnt the rhythm and the sounds of the spoken words; she noticed if you accidentally read something wrong or missed out a page, and she would pull you up on it. She wasn’t technically reading the printed words on the page, but it was all groundwork, and it was all her own. When she was about three, she started to play around and have fun with the text in her favourite books. She’d place her thumb over the last word on a line, so that I couldn’t read it, and would giggle when the sentence ended up making no sense. She would ask me things like, “Where does it say crash, mummy?” and she would point to words that started with the same letter as her name, and ask what they were. She would trace along the lines with her own finger, moving it faster or slower, and would whoop with delight when I changed pace to match her as I read aloud. Over those 2 or 3 years, she went from passively listening to stories, to being able to recite whole picture books by heart, and experimenting playfully with text and language. Around the same time, she began to recognise a few words by sight, like the big ASDA shop-front sign, which she’d also spot on food packaging, and like the titles of her favourite books and TV programmes. I knew that she was recognising them because of their characteristic visual appearance (the bold, capital, green letters of ASDA, for example), but alongside that, just like with the learning of her picture books of by heart, she was creating associations (albeit likely subconsciously) between the way words and letters looked in print, and how they sounded when spoken. Because she seemed to be fascinated by words and letters, we picked up some alphabet cards, and I blu-tacked them to a cupboard over out kitchen table, where we sat every lunchtime to eat together. I can’t remember how the game started, or who initiated it, me or her, but she ended up asking for this game every day. While we ate, I would point to a letter, stuck on the cupboard, and she would say its sound. I started easy: the J in her name; the M in mummy; the S that looked like a snake. She’d ask me for more. One day, when she knew a few of them, I moved them over to a strip of wall beside the cupboard, to get them out of the way, and so began ‘the tower’ of letters that she knew. From them on, each time we played we’d build the tower of alphabet cards as high as we could, up the wall, and almost to the ceiling, eventually. It was her game, her motivation. It was her asking to play. At about 4, she began asking if she could read the bedtime story, instead of me. By this time, she was familiar with so many picture books, and knew many of them word for word. We changed how we managed bedtimes (we had a 3 year old and a 4 year old that we had been reading to together) so that Jess could be afforded the time and patience needed without frustrating Amy. She would choose a book, one that she knew inside out, and as she turned the pages of the book, she would tell the story. At first, she would do it from memory; some of her wording was different to the words on the page – she was retelling as best she could remember, rather than actually accurately reading the words. But I let her, because I could see the value in her feeling of achievement and independence, and I could sense the damage I would do if I were to stop and correct her. And besides, even we adults don’t always read things accurately: we make mistakes; we skim read and fill in the blanks. At that stage, technical accuracy was less important than the pride and self esteem I could see that she was getting from being the reader instead of the listener. As time went on, she began to pay more attention to the actual text on the page. She would often spot when her own remembered words didn’t match up with the words on the page, and she’d look at the text more carefully, sometimes figuring it out from initial letters, sometimes asking me to read it instead. At some point, she stopped asking to be the reader, and wanted instead to go back to being read to again. And of course that was fine – we went back to all snuggling up together with me in the middle, reading. We followed her lead and went with it. It was also around this time that she started to want to type words into her tablet. She’d ask me to type “surprise eggs” into you tube, or she’d ask me to type in the name of whichever creature she had just created in an app. She started playing Minecraft, and asked me to help her write signs, or name her worlds. For a long time, I was her tablet scribe, which at times seemed endless and relentless and frustrating (for me and her!). Playing Minecraft was one of her big motivations in learning this new-found skill. I’d join her in her world, from my own tablet, and we’d build together, sometimes working on the same structure, sometimes creating our own separate ones. She’d ask me about the names of the items in the inventory. She would read my signs I wrote around my Minecraft house… bedroom, bathroom, upstairs… ones she could easily figure out in context, even if she couldn’t decode the whole word through its letters. She began to write in the in-game chat – things like “hi” or “hello” and of course, things she found funny like “poo” and “wee”. And I’d write really simple lines back, simple one-syllable words, that I knew she’d be able to figure out: “look up”, “take this”, “I love you”. Soon, despite the fact we sitting on the same sofa, we were chatting back and forth through text on in-game chat. Jess would often tell me off if I said something out loud instead of writing it. She loved it. She started writing more of her own Minecraft signs, to explain what something was, or to welcome you to her shop, or to label different people’s aeroplane seats with their names. She started playing on Roblox and also on Minecraft minigames servers. She loved the games in which she’d be given a category and have to either build something or design an outfit to fit that category, which would then be put to a vote. Time and time again, I was called on to read the category to her, so she could compete. And I’d grit my teeth and read it to her, for the 29th time that day, trying not to sound exasperated. Then, one day, on Roblox, she suddenly found a way to do it without me. She would look at the word (winter, for example), and even if she couldn’t understand it, she’d type the letters into the search bar on the clothing inventory, and see what came up. The array of clothing in the results would give her all the clues she needed to then figure out the word. Suddenly she was independent. With books, she had begun to enjoy hearing Mister Men and Little Miss books. She’d previously loved the Biff and Chip series, but had been looking for something different, and Mister Men books seemed to hit the spot for her. She loved the humour; she loved the layout and format, and she loved the fact that there were words that she hadn’t heard before, like nincompoop and calamity and curious. She suddenly found joy in exploring a whole new range of vocabulary (something that’s conspicuously missing from any phonics reading scheme). At some point (the first time I remember it was on a short car journey) she started to read the books to herself, in her head. Back online, she grew desperate to chat to other players in-game. 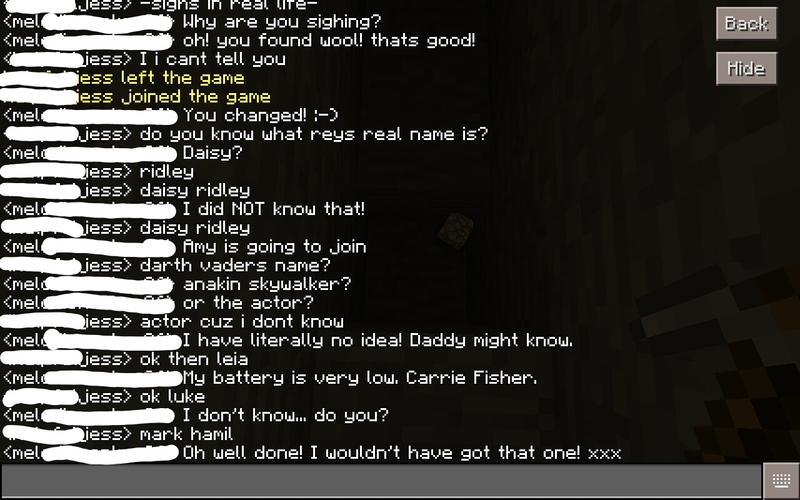 Both on Minecraft servers and in Roblox games, she watched the chat. I never managed to get the hang of Roblox, but she didn’t need me. She played role-play games and would write her messages to other characters in the game: the shopkeeper, the school teacher, the baby she was adopting. Suddenly her ability to read words and sentences exploded, and she was writing messages back and forth in full-on dialogue. By this time, we had set up a Skype account, to allow Jess to talk out loud, across the ether, to her friend that she often joined online. It wasn’t long before she started writing messages on Skype, too. Offline and away from gaming, throughout those couple of years, she also began to add words to her drawings. Simple names came first, then speech bubbles and signposts. As she grew – and her ideas and her stamina and her patience developed – her drawings became more like comic strips, with multiple speech and thought bubbles, leading on to cartoon-strip sequences, with some text in each picture. When she was 5, she had been given a DanTDM graphic novel as a gift. After asking me to read it to her in the beginning, she had confidently read the rest of it independently, and I’m pretty sure this was a big part of the inspiration behind her comic-strip drawing style developing. Jess is now 6. She loves to draw, but almost every drawing has some writing on it: a speech bubble, a thought bubble, a signpost or a caption. In her mind, there is no distinction between drawing and writing; they are two sides of the same coin – a natural progression in communicating the idea that is in her head, onto paper, to show others. She sometimes plays online games for hours, always socially, communicating with fellow team-members, competitors or role-playing playmates. She recently whispered to me (proudly but not boastfully) that she’d just read a whole chapter book in one go. And most recently, she brought her tablet to me, to show me the most amazing story she had typed into a book on Minecraft – a wonderfully crafted suspense story, complete with beginning, middle and end, of two sisters stranded in a haunted forest, and the horror that befell them. Of course, to her, it feels strange. She doesn’t remember the particular steps along the way. Her progress in learning to read and write was never a part of anyone’s laid-out plan. She was never told, “Let’s learn about full stops,” or “Great, now you can read 12 sight words,” or “You can’t read that book – it’s too babyish/too hard”. Instead, she was given the time, the space and the opportunities to pursue it as she wanted; as she needed. When the desire or the need arose, she seized it and never looked back. Nobody else ever taught her to read. It wasn’t someone else’s teaching success. This was all her own accomplishment, her own achievement. One that I hope she will always feel proud of. Follow me on Facebook. Hope to see you there!